The best jingle player for Windows comes to the iPad! 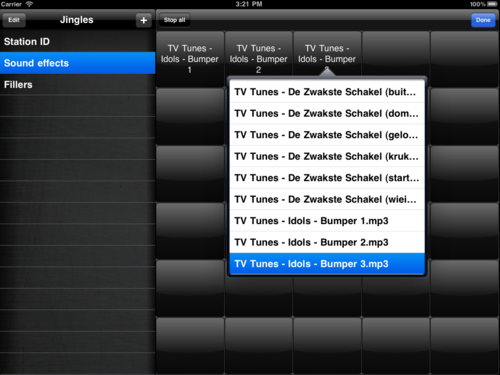 TJingle for iPad is a jingle player for (radio) deejays and artists. Like its bigger brother, TJingle is very easy to use and fast. With support for multiple pages, you can have access to a virtually unlimited number of jingles with only two taps on the screen! TJingle plays any file format that the iPod application on the iPad will play. You can transfer any audio file directly onto the device using iTunes (the sounds do not have to be in your music library!). TJingle is used by various regional radio stations. It was even used for a while by a deejay at 3FM.